All the bow ties in this category are pre-tied. 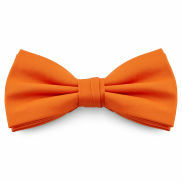 Bow ties have made a fashion comeback when it comes to everyday wear, no longer being restricted to formal events. Wearing a bow tie, especially a very colorful one, is an expression of individuality, giving you that independent thinker vibe. They also just look great and help you stand out from the crowd. Use the menus to browse through all available materials and colors. "Work smart, not harder." 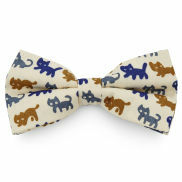 Sure, Christopher Thomas was probably not thinking of bow ties when he coined that phrase. Nonetheless, it applies well to pre-tied bow ties. Some people have trouble tying up an ordinary necktie and are quite hopeless when it comes to tying a self-tie bow tie. And we don't see anything wrong with that. Life's short. Why bother, then? A pre-tied bow tie is hard to tell apart from one you've tied yourself. It also goes on in seconds and stays where you put it admirably. Who needs the hassle, right? 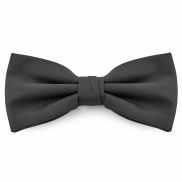 The attraction of pre-tied bow ties is in their snazzy looks, ease of putting on and taking off, and the fact that they're generally quite affordable. Pre-tied bow ties require less material and are typically narrower and more compact than self-tie models. Frankly, none we could think of! Don’t see what you're looking for? Please contact us, and we'd be super happy to help you out or hear your suggestions regarding products we should be carrying.